Practice using MATLAB to manipulate an image. Find objects in an image. Object detection and recognition are common processes in many computer vision applications. State of the art algorithms use various image representations to select importent entities from an image and differentiate between hundreds of objects. 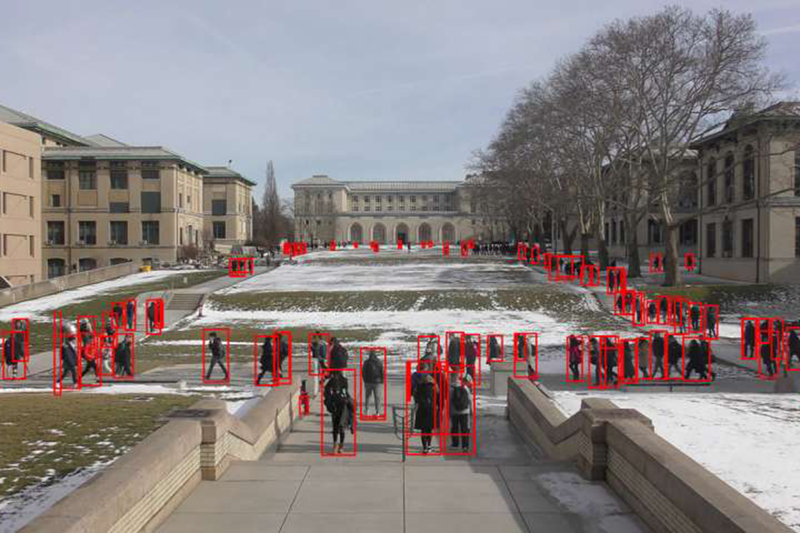 Rapid object detection from CMU Professor Fraz Franchetti's lab. Image from ECE Press Release. For this homework, you are only working to locate one known object (a pixelated Waldo). Feature matching (where you compare sections of you new image to the known sample image) should be sufficient for this assignment. You will need to scan the given environment image and determine if the set of pixels matches your known Waldo images. Is it sufficient to just look for a portion of your known Waldo image? How many pixels should you examine at once? How many times should you examine the same patch of environment? How will you identify rotated Waldo images? How closely must the test and known image match in order for the two to be considered close enough? The specifications for the assignment are presented in the following document. For this assignment, we are dealing with a 2D representation of the world and a fairly well defined object that we are trying to locate. We did have to deal with a bit of scale and orientation varience, but we did not have to combat issues of lighting, shadows, occlusion, deformation, or 3D orientation variation. When it is not feasible to compare an object in question against all possible sample images, you can use information about the relationship between keypoints in the test image compared to sample representations or abstract the image entirely as an encoding of features. Professor Kitani's lecture on Object Recognition goes into more detail about these methods: 16-385 Lecture 9 and 16-385 Lecture 10 (linked with permission).